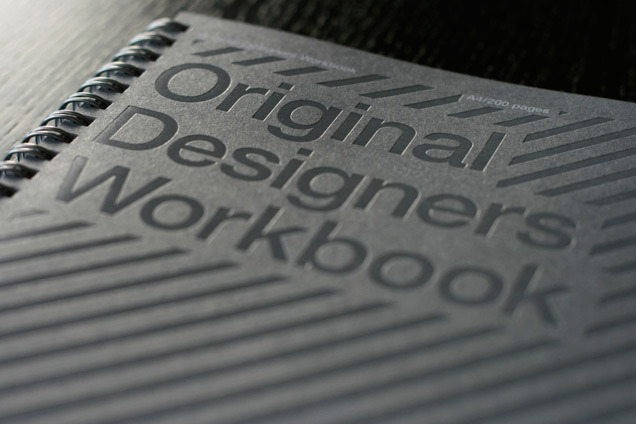 In 2009 we invested in producing our first retail product; the “Original Designers Workbook”. Created as a notebook and sketchpad for the design and creative industries it has been very well received, with Grafik magazine calling it “invaluable” on their blog in 2010 having discovered just how useful they are. The concept of the books is to provide a very basic structure to a creatives notebook or sketchpad, to help them find their notes and sketches relating to the multitude of projects they are working on at a later date. They also provide a rare page type – a grid. They come in five coloured covers with matching spiral bindings: Red, Green, Blue (sold out), Black (sold out) and Silver (also sold out). Since launch we’ve sold them across the UK in places like the Design Museum in London and via our own online shop. We have almost sold out of the first batch and are currently taking a view on producing a second batch.